William A. Gentry, PhD, a senior research associate at the Center for Creative Leadership wrote an interesting series of articles for BusinessWeek about the wordless debate that took place between Presidential candidates. I think his observations and lessons are invaluable for all leaders and his articles are must reads! People communicate nonverbally through rhythm and their use of time, the way they dress, their gestures and posture, distance and touch, tone, and facial expression. Research in the communications field shows that nonverbal cues can convey as much as 93% of a conversation’s meaning. Successful leaders communicate effectively—not only with their words, but just as important, through nonverbal actions. So viewers of this year’s Presidential debates won’t just hear words. They’ll see and read the candidates’ nonverbal behavior, and they’ll use it to determine which is likely to prove the better leader. 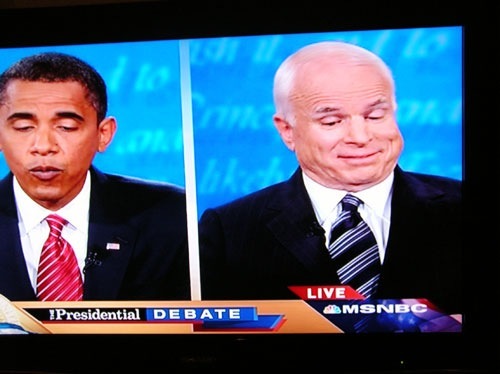 Nonverbal communication has been a critical component of Presidential debates from the very first televised forum. In 1960, Richard M. Nixon’s five o’clock shadow helped make him look pale, sickly, and thin. Michael Dukakis was criticized in 1988 for his lack of emotion and stiff posture. George H.W. Bush looked at his watch during a 1992 debate, suggesting impatience, boredom, or lack of interest. In 2000, Al Gore’s sighing and eye-rolling made him less likable. Depending on your political persuasion, you may agree with Gentry’s specific observations or not; however, the important takeaway from his articles is that how you carry yourself as a leader is as important, if not more important, as what you say. While some might feel that this is a sad commentary on the shallowness of followers, I don’t necessarily agree. Human beings are hardwired to accept nonverbal cues from those around us, friends or foes. As a leader, it’s important to understand that and manage our actions, expressions and emotions according to the situation because whether we like it or not, they are integral to the delivery of our messages. Here are the links to Gentry’s articles in BusinessWeek and the Center for Creative Leadership blog, Leading Effectively. Think about your own experience of exercising leadership while reading them. Tagged with BusinessWeek, Center for Creative Leadership, communication, President Barack Obama, Presidential Debate, Senator John McCain.